When it comes to trying new techniques we are all familiar with the old adage ‘the proof of the pudding is in the eating’. In the case of Film&Film (F&F) Wrapping, cow herds across the world are literally doing the eating as this innovative new, wrapping technique gathers momentum from Scandinavia to Australia and all balewrapping points between. Sinnan Glynn is a dairy farmer based in Co. Galway, Ireland milking a 140 head full Holstein pedigree herd all year around. Sinnan’s larger than Irish average herd is unique in that they are fed all baled silage. Usually in Ireland, a herd of this size would be fed clamp silage. Efficiency is key to this dairy operation as just Sinnan and a labourer are available to carry out the regular day-to-day farm duties. Sinnan contracts out all of the routine farm tasks (baling, slurry etc) leaving him free to focus on the Holstein breeding programme which is conducted mainly through AI but also utilising a Holstein bull. Over the years Sinnan has tried it all. From trailed to precision chopped to wagons filling two silage pits but he recently moved away from clamp silage following a bad experience with same. Unfortunately, Sinnan’s first clamp wasn’t filled properly which meant he had to rethink his feeding options that year. 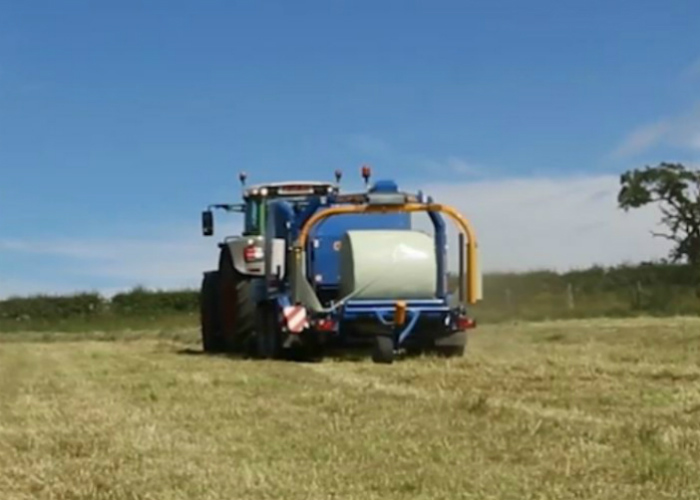 As the time to fill the second clamp approached, Sinnan did not want to risk a recurrence of the problem so he asked his local baled silage contractor to bale the crop instead. 450 bales were made using the Film&Film (F&F) Wrapping System – the combined use of Baletite netwrap replacement film and Silotite balewrap. In addition to creating more compact bales that better withstand handling and storage, the F&F Wrapping System also helps to reduce silage losses through an enhanced oxygen barrier that discourages mould growth. During balewrapping 3.5 turns of Baletite netwrap replacement film were applied prior to 4 layers of Silotite. Over the following winter Sinnan fed out the baled silage alongside the silage from the first clamp. He noticed how much fresher the F&F baled silage was compared to the clamp silage and also the marked reduction in waste. Sinnan had always had issues with the pit face heating up (secondary fermentation) when feeding out silage, especially in late winter/early spring – a problem he did not experience with the F&F baled silage. Sinnan decided to have both the bale and pit silage analysed which revealed that the baled silage had a higher DM. After this first experience of F&F bales, Sinnan approached a dairy nutritionalist for advice as he wanted to do the best for his herd. He knew that he was going to put all his second cut into bales but wanted to discuss the implications on milk yields of putting his first cut into F&F bales also. When it comes to the silage crop, Sinnan’s focus is quality over quantity to achieve the highest levels of liquid milk. After much deliberation, Sinnan made the decision to put all his silage into F&F bales and he hasn’t looked back since. Baled silage provides Sinnan with the flexibility to maximise the different crop types (mainly grass with some Italian ryegrass and some clover) and the wet/dry ground found on the farm – allowing him to take a field/crop when it is ready and of highest quality as opposed to having to harvest an immature crop just to fill the clamp. The move to baled silage has allowed him to tailor the ration for his herd. Sinnan has three separate bale stacks – which totalled 1900 bales at peak in 2013 – one stack for his milking cows, one for his dry cows and one for his sucklers. On average bales are kept for between 7-12 months and are used for winter and buffer feeding. Whilst some people believe F&F bales to be the more expensive option, Sinnan did his calculations for clamp versus bale and bale came out favourably. For clamp silage Sinnan was typically paying his contractor €110-€115 per acre (tedding and raking it himself). Taking into account the cost of hiring in two additional labourers a day’s wages to cover the pit was costing him between €500-€700 to fill the pit. For his dry cow silage where he was aiming for 45% DM Sinnan was getting 7 bales per acre at between €10-€11 per bale, so it was working out cheaper than putting it into the clamp. In terms of operational efficiency, the farm record was set when they managed to bale 60 acres of F&F bales in 8 hours. Commenting that it was one of those days when everything came together, Sinnan confirmed that an average of 60 bales per hour – one a minute – was achieved using five tractors, four flatbed trailers, a loader in the field with another in the yard to stack the bales. Before making the decision to switch entirely to F&F bales, Sinnan needed to address the issue of the feeding-out the bales. With just Sinnan and his labourer working the farm, labour is short and efficiency is critical. Sinnan approached McHale who provided a prototype bale shear to test. Whilst a few minor modifications have been made, the shear has been key to making the F&F system work with their Keenan mixer wagon. The F&F wrapping system, the bale shear and the mixer wagon all combine to create an easier feedout with minimum human intervention. Additionally there is the added bonus of easier film recycling as there is no need to separate the Baletite from the balewrap for recycling (unlike net).